My story starts with a problem. My family and I lived in a quaint 2,200 square foot home on a beautiful five-acre property. We had animals aplenty, great neighbors surrounding us, and gorgeous views of stunning sunsets. Every spring, the thunderous roar of hundreds of frogs echoed from our marsh down the cul-de-sac, awakening slumbering creatures from hibernation. We loved our slice of heaven, but a hidden fire-brewed in my soul. Like most families, we thought we were living the “American Dream.” Until one day out of nowhere, I awoke to the truth: I wasn’t happy! I was far from happy! I was tired, sick, stressed, and in turmoil. I ran a licensed organic daycare in our home and also coached gymnastics part-time. I loved and excelled at both jobs, but I was worn down. A year-and-a-half into my daycare adventure, I became pregnant and lost touch with self-care. Almost every night I was up past midnight cooking, cleaning, doing paperwork, researching how to have a natural pregnancy, and trying to spend as much time with my husband as possible. I was walking on eggshells trying to be sure everything got done and everyone was pleased. My health started failing after another year-and-a-half of living like this. I later learned I had adrenal fatigue and hyperthyroidism. With a heavy heart, I closed my daycare, thereby closing the door on teaching and caring for other children. Our livelihood could no longer depend on my gymnastics coaching. We needed a big idea to stretch our income. That’s when we discovered tiny house living. We have been living in our tiny house for over a year and can’t believe how our lives have changed for the better! It now takes about fifteen minutes to vacuum, mop, and dust. The more than two hours I used to spend cleaning are now dedicated to self-care, writing my latest book, and spending quality time with my family. We also have time to do what we love: biking, hiking, nature walks, rock climbing, swimming, and gardening. Two hours per week spent cleaning, or approximately eight hours per month, were reclaimed for me. Multiplied by 52 weeks, I saved 104 hours per year, increasing quality time with my family. This has brought joy to my marriage and our relationship with our son. We were always rushing off to work, running errands, or maintaining the house, garage, second garage, lawn mower, water filter, garden, yard, and landscaping. We sat in the same space, but didn’t mindfully engage with each other. Our tiny house ensures we are always within earshot of each other. Some may see this as a downside to living in a small space, but it provides us more time for self-care, so it all balances out. It encourages us to be more mindful of constructive conversations. The financial freedom that attracts many to the tiny house community is not solely a financial benefit. Being mortgage-free has allowed me to homeschool our son, write a minimalist book to inspire others to love the life they live, and write a mother’s book on holistic parenting. I have had the freedom to harvest for organic farmers and have my own large organic garden at home. My family loves to travel, but in the large house we felt stuck—extra income went into maintaining the property. We now live within our means and are stress-free, giving us ample time to reflect on our goals. This summer will be spent driving around our state exploring parks and lakes in our camper, which we had neither time nor money to do when we were tied down by the responsibilities of our large house. Decide what you most value. Maybe your living arrangement doesn’t support those values, with possessions tying you down. Perhaps you’re living outside your means. A minimalist life doesn’t necessarily mean a less than 500 square foot home. It can mean living simply with great joy in your heart and with the Earth in mind. Free yourself from your possessions by adding memorable experiences to your life and sharing those experiences with the ones you love! 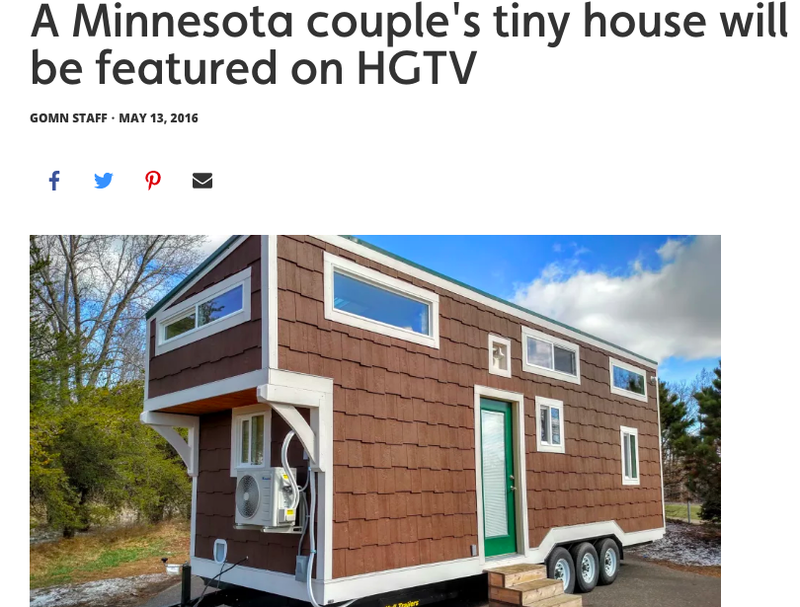 We were luck enough to be featured in our local paper, The Pioneer Press, as we shared our love of tiny house living. 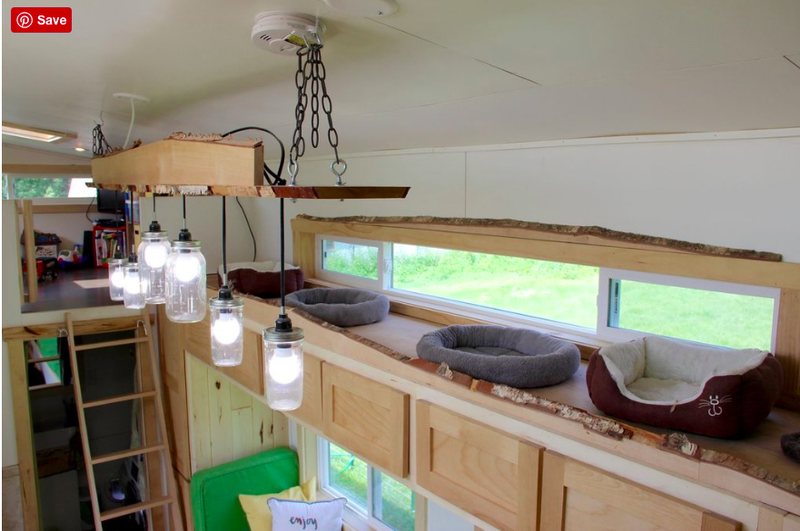 We had the joy of being featured on an episode of Tiny House Big Living. They followed us through the whole build of our tiny house. It was such a blessing to be a part of their project. We miss our tiny house dearly but we will be building a similar small version shortly. After living in a large house, apartments, double-wide trailer, camper and tiny house, we now know for sure that tiny houses are our favorite way to live! You've probably seen them: camper vans, Airstreams, and old RVs chugging down the road, heading off to some impossibly remote mountain pass, trout stream, or Wal-Mart parking lot, carrying the sorts of adventurers who are more concerned with experience than the size of their house. What they've given up in possessions and comfort, they make up for in enthusiasm and opportunities of the open road. Erik Nelson talked to four of these wanderers to find out why they chose to live like this, and how they customized their trailers, vans, tiny homes, and RVs. Here, he presents stories from their lives on the road. " An interview with GoMN.com about living in a tiny house in Minnesota. Matt was kind enough to let me interview for the first time as we discuss simple ways to downsize and the future of affordable housing and much, much, more. Matt's podcast will bring you to a whole new understanding of yourself and the world around you! Don't forget to check out his amazing book "Zen Athlete" as Matt takes mindfulness and sports to bring you to a new level of athleticism. "Zen Athlete is a practical guide to self mastery, clarifying the art of mental training, flow and peak performance." Join Sheila Sutherland and I as we discuss how to ignite your purpose through minimalist living. By minimizing the distractions in our lives we can focus on what's important to us. We discuss ways simplifying your life can forever change your life through increased abundance, time and joy. Sheila's podcast, "Reignite Your Purpose-For Life, For Love, For You." Will inspire to you to make the changes in your life required for love, joy and laughter to return to you in full. Her guests will inspire you to make baby steps towards the new you with love in your heart and abundance on your mind. "Sheila Sutherland is a Certified Life and Relationship Mastery Coach, Professional Educator, Speaker, Podcaster, Best Selling Author and is the ONLY licensed Oh, Shift® Facilitator in Canada. Sheila believes that the relationship with self is the foundation upon which everything in your life is built and is on a mission to take the selfish out of self-care and self-love, as you deserve to be a priority in your own life! Sheila empowers people to effectively manage their emotions through shifting their mindset, behaviors and communication, so they can live a more authentic, connected and vibrant life." I had the honor of being interviewed by Marianne for her podcast "Sustainable Living Podcast" in an effort to share my love of living simply, to encourage others to try a more sustainable lifestyle. Find out what minimalist living can do for you and how it will open the door to healing your mind, body and soul, as you acquire more money, time and enjoyment for life! Join Marianne and Jenise as they discuss the following on their podcast "Sustainable Living Podcast"
"What would it be like to live in a world where we no longer create endless trash; are no longer bathed in toxic chemicals; and where all our activity no longer revolves around working 40 hour-a-week jobs we hate? What will we eat? Where will we sleep? How will we spend our days? Join us, Marianne West and Jenise Fryatt, as we attempt to draw a detailed picture of what Charles Eisenstein calls, “the more beautiful world our hearts know is possible.” Not only do we believe it’s possible, we, along with countless others from around the world have already started to create it."